SatoshiDice Dice Games Review – Scam or not? 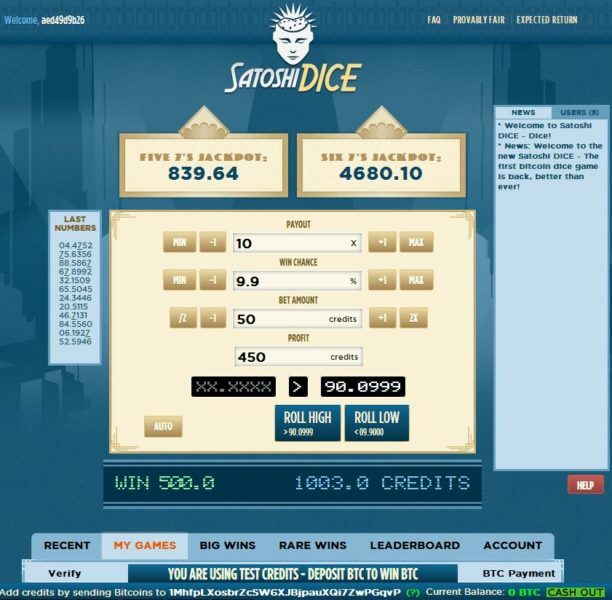 Unlike any other online casinos out there today, Satoshidice.com is far different from the façade of glitter and neon lights. They keep out of those styles and just stay with plain old Dice Game. This is the feeling that you get when you first visit their website. I’m sure I got that feeling! Anyways, we are here today at their website to try out their Dice Game and get to know the features of it. As mentioned previously, they are different from any other websites out there today as they only offer one type of game and that is Dice. Today let us look closer to their Dice game and learn how to place a bet or two. Their website is plain and simple; this also resonates to their design in general as you are not confused on where to go and what to do when you log into their website. Everything is there right in front of you. Once you have logged into their website you would be prompt that you are just using play money and that you can deposit real Bitcoin into your account anytime you want. This is a subtle reminder that you can easily bet Bitcoins with them; which I personally like. You can start the game by choosing your payout odds, win chance, bet amount and this would then show you your profit you hit the adjustments that you have made. Once everything is in place you just need to click on either ROLL HIGH or ROLL LOW to start the game. 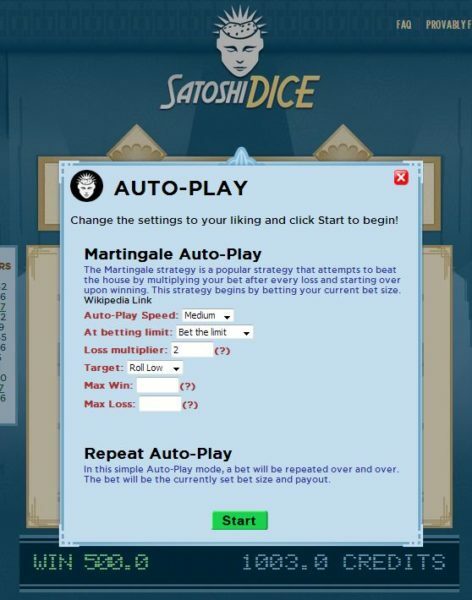 Here in Satoshidice.com, you are also able to create auto play sequences in order for you to just sit down and relax and watch your credits go up. This feature is for experienced dice players that already know how the system works. But of course, no one is stopping you from trying it out yourself. If you like numbers and the probability game, then this feature is for you! They call it the “Martingale Auto-Play” as this is a strategy to attempt and beat the house by playing multiple bets in very rapid succession. On this window, you are able to tweak your “Auto-Play Speed” in which you are able to choose from Slow, Medium or Fast. This means that the draw time is either snail slow or flash fast. Below the play speed would be the betting limit in which you are able to choose between “Bet the limit” and “Reset the limit”. Moving forward, we’ve got the “Loss Multiplier” wherein you are able to tweak as well. Below the Loss multiplier, you have the Target bet. This means that you are able to set it to either “Roll High” or “Roll Low” depending on your strategy. Below would then be the “Win” and “Lose” tabs wherein you are able to choose how many times the system will roll the dice for you. The website Satoshidice.com is really something if you are into this kind of Dice Game. Some people would love to see a dice rolling over on different sides, some would like digital dices just like the ones that Satoshidice provides. Oh, and by the way, they have free games! So that is a plus!